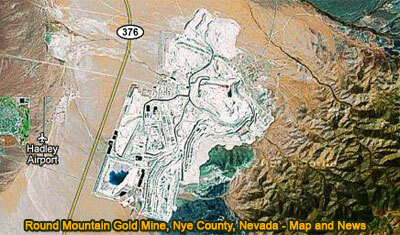 Round Mountain Gold Mine, Nye County, Nevada, Map and News. Elearning. Explore the geometry of the Round Mountain Gold Mine, Nye County, Nevada, through detailed Google satellite imagery. To Pan: click and drag the map. Take advantage of the zoom bars. Round Mountain is an open pit mining operation located in Nye County, Nevada. Most of the people who work at the mine live in the nearby communities of Hadley and Carvers.